Laing O’Rourke, Bam Construction and Morgan Sindall have all been invited to continue to the next stage of the bidding process for a £97M batch of private finance schools in Yorkshire. The Education Funding Agency announced that the firms have been shortlisted to proceed to the next stage of the procurement process on the Priority School Building Programme Yorkshire Private Finance batch. 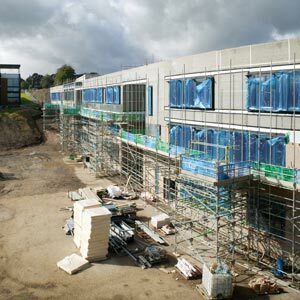 This will involve the construction of seven secondary schools across Bradford, Kirklees and North Yorkshire. The names of the schools involved are All Saints Catholic College, Huddersfield; Belle Vue Boys’ School, Bradford; Carlton Bolling College, Bradford; Harrogate High School, Harrogate; Oakbank School, Keighley; Samuel Lister Academy, Bradford; Whitcliffe Mount Business and Enterprise College, Huddersfield. The contract winner will design, build, finance and maintain the schools under Government’s new private finance model (PF2). Construction is due to start from November and will continue to March 2015, with planned completions due for August 2016. This will be followed by a 25 year operational term. The Priority School Building Programme was set up to address the needs of 261 schools across the country in most need of urgent repair. So far the Government aims to let five contracts to deliver schools using private finance. The Yorkshire batch is the fourth privately financed batch of schools to come to market. An Interserve/Kajima joint venture won a £150M batch of seven schools in Hertfordshire, Luton and Reading while Miller Construction, Laing O’Rourke and Sir Robert McAlpine are chasing 12 PF2 schools in the North East, worth around £120M. In the North West Laing O’Rourke, Morgan Sindall and Vinci are in competition for 12 schools worth £100M. An invitation to prequalify was sent out last week for eight secondary schools in the Midlands, expected to cost around £120M to build.